Sea ice is seen from NASA's Operation IceBridge research aircraft off the northwest coast of Greenland on March 30, 2017. This sea ice is some of the oldest and thickest in the Arctic. Wind and currents normally shove lots of ice up against the northern coast of Greenland, where it stacks up and clings for years. "It's like a crowd entering a stadium," Scambos says. "It's sort of pushed by the ice behind it until it's packed really tight, and that's made it thick and durable." Think of those long-lasting mounds of ice left on city streets by snowplows — but up to 30 feet thick. 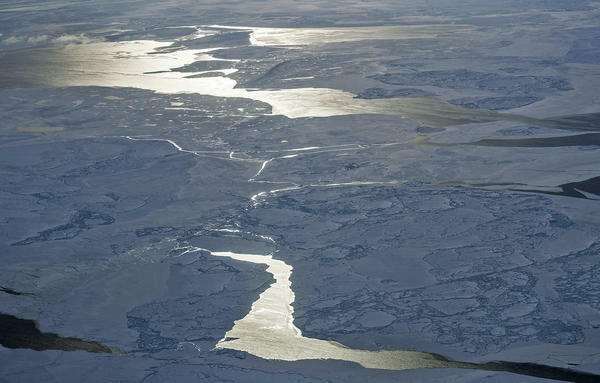 Global warming, however, has finally begun to break up this ice, Scambos says. The Arctic is warming faster than any other part of the planet; last February saw remarkably warm winter temperatures there. The normally year-round frozen ice "kind of rattles around in the Arctic now," he says. "And [in] this area north of Greenland, what we're seeing is that the ice is so thin and sort of loosely packed that a few days of strong winds in an unusual direction can push the ice away from the coast that it always collided with in its drift pattern." Polar scientists have watched the duration and extent of Arctic Ocean ice decline for many years as a result of warming. But the loss of the Greenland section shows that warming is also changing how ice moves. And while the Greenland ice breakup may be out of sight, for polar scientists, it's not out of mind. It's another shift in the Arctic environment caused by warming. And scientists point out that the Arctic environment — its ocean currents, ice floes and wind patterns — affects the jet stream, which in turn influences the weather that people get across the Northern Hemisphere. There's something unusual going on in the Arctic Ocean, something scientists haven't seen before. A huge pack of floating ice is breaking up and drifting apart. As NPR's Christopher Joyce reports, polar scientists say it's one more consequence of climate change at the top of the planet. CHRISTOPHER JOYCE, BYLINE: The Arctic is warming faster than any other region on Earth. As a result, the ice that floats on the Arctic Ocean is shrinking. But one place where sea ice has largely survived the warm weather for years, in fact, is along the north coast of Greenland. Polar scientist Ted Scambos says that's because wind and currents shove lots of ice up against the shore where it can stack up to 30 feet thick. TED SCAMBOS: Like a crowd entering a stadium, it's sort of pushed by the ice behind it until it's packed really tight. And that's made it thick and durable. JOYCE: Think of those long-lasting mounds of ice that snowplows leave on city streets. But Scambos says now global warming has loosened the ice's grip on the Greenland shore. SCAMBOS: It kind of rattles around in the Arctic now. And this area north of Greenland - what we're seeing is that the ice is so thin and sort of loosely packed that a few days of strong winds in an unusual direction can push that ice back away from this coast that it always collided with in its drift pattern. JOYCE: This year's breakup started with a very warm February in the Arctic on top of record warm weather over the past decade. Scambos is with the National Snow and Ice Data Center. He says warming affects not just how much ice is up there but how it moves. SCAMBOS: We've never seen anything this large in terms of an opening north of Greenland. JOYCE: The Greenland ice breakup may be out of sight, but for polar scientists, it's not out of mind. It's another shift in the Arctic environment caused by the buildup of greenhouse gases. And that environment - ocean currents, ice flows, wind patterns - affects what kind of weather people get here in North America. Christopher Joyce, NPR News. Transcript provided by NPR, Copyright NPR.